CORAL SPRINGS, Fla., Oct. 31, 2018 /PRNewswire/ -- Wounded warriors and their families learned more about warrior support programs during a Wounded Warrior Project® (WWP) event. 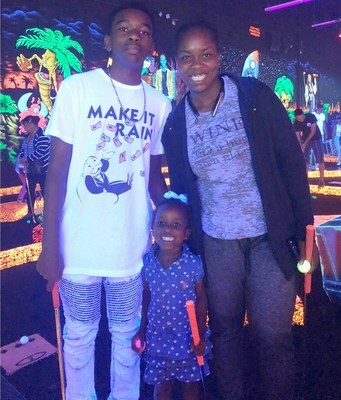 Participants gathered to spend quality time and have spooky fun at Monster Mini Golf, a family entertainment venue in Coral Springs. "The activities Wounded Warrior Project provides are awesome," said Army veteran Agar Joseph. "The events vary, and they give you opportunities to try new things and places. It gives a veteran one less excuse – disability is not a barrier, neither is expense – and the best part is that my family is involved." Warriors never pay a penny for WWP programs, because they paid their dues on the battlefield. "My children and I get to experience places and activities we never knew about, create new memories together, and meet other families," Agar said. "Wounded Warrior Project has encouraged me to go out, which I don't do often; volunteer in the community; and focus elsewhere. It is great therapy." Agar's son and daughter enjoyed playing mini golf until it was almost time to shut down the venue for the night. "We were having a good time, and we didn't realize they were closing down. We had a blast playing all the holes, and then tried the arcade," Agar recalled. "My family and I always leave Wounded Warrior Project events feeling better than when we arrived," Agar said. "I learned about Wounded Warrior Project from another veteran, and in return, I tell fellow veterans and encourage them to try Wounded Warrior Project events." In a survey of the veterans WWP serves (https://www.woundedwarriorproject.org/survey), four in five respondents registered with the organization for social engagements and support. Connecting veterans with each other through fun opportunities gets them out of their homes, in places where WWP can help.